Is your DHA Laboratory State of the Art? We often write about dust hazards analysis testing (DHA), combustible dust control, flammability, thermal hazards and other process safety topics effecting every industry. Over the last month, I noticed 480 internet searches for "DHA laboratories". Makes sense, as 80% of industrial dusts are combustible. Of additional concern, however, a quick search shows there are a plethora of new companies popping up that are actually small labs or 3rd party vendors who broker testing. 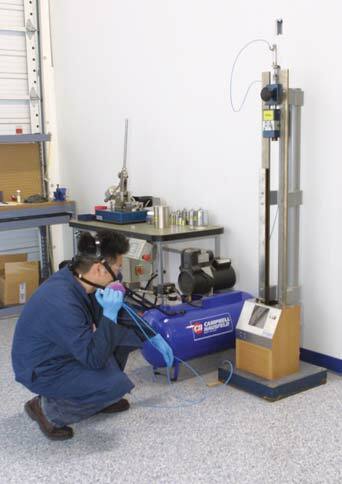 While brokering dust testing and consulting makes sense when done in tandem with the purchase of dust collection equipment, for example, we urge precaution in understanding the "why" and "how" a full service DHA testing lab is essential. Combustible dust hazards gained additional exposure due to the OSHA Combustible Dust National Emphasis Program (NEP) which was re-issued as a result of the fatal accident at Imperial Sugar. Few labs offer a full range of services related to characterizing, preventing and mitigating combustible dust explosion and fire hazards. These services include combustible dust testing, onsite assessments, OSHA compliance assistance, audit preparation, training, ignition source evaluation and vent sizing calculations. When developing mitigation strategies for explosive or combustible dusts, it is important to characterize the hazard risk of the material in question by determining its explosion severity and ignition sensitivity. Explosion severity data will determine if an explosion hazard exists, and if so, how energetic it may be while ignition sensitivity data will assess the probability of risk based on how the material responds to heat, spark, impact and frictional forces. Your lab should offer NFPA & OSHA Combustible Dust NEP Testing Services for determination of both explosion severity and ignition sensitivity per ASTM and European EN methods. 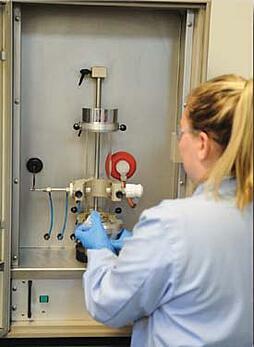 Testing is completed on-site in our state of the art dust testing facility per ISO 17025 guidelines. 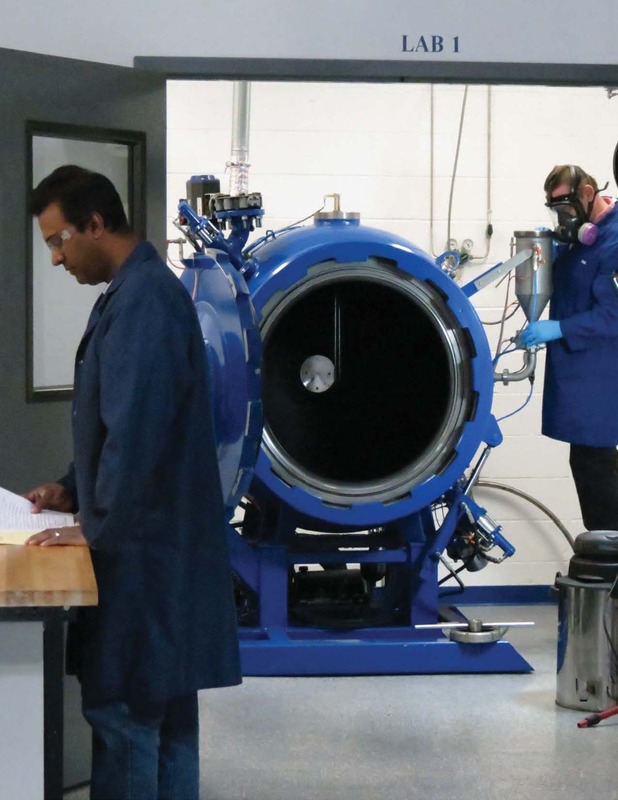 The state of the art combustible dust testing lab at Fauske & Associates, LLC features one of only a few 1 Cubic Meter Chambers in the United States as part of its comprehensive Dust Hazard Analysis (DHA) services. 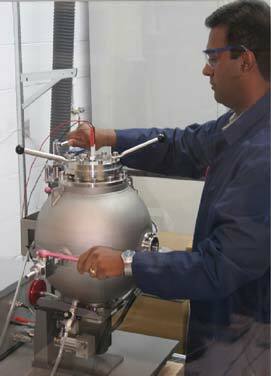 The Cubic Meter Chamber (1m3) can be used to verify testing results from the smaller 20L chamber. The smaller size of the 20L chamber may sometimes result in what is called, “overdriving.” This is a result of the material coming in contact with the ignition source in the 20L chamber. The Cubic Meter Chamber is not susceptible to overdriving due to its size. The rule of thumb is to consider testing in the 1m3 when your KSt is below 50. Keep in mind, the amount of sample needed to conduct a test in this chamber is much larger than the standard 20L chamber. Some of the tests need at least 20-30 lbs. of usable sample to complete a series of tests in the 1m3. These are generally sent to our lab in 50 lb barrels. Tests that can be performed in the 1m3 are the Explosibility Screening Test or Challenge Test, Explosion Severity Tests - KSt Pmax, Minimum Explosibiity Concentration (MEC) and Limiting Oxygen Concentration (LOC) of your material. We design, custom develop and deliver any site specific training materials needed by your organization. Our consultants, engineers and technical specialists are available to deliver the classroom, lab or on-the-job training your staff needs. In addition, we will assist with the identification and procurement of commercially available training materials where available. So, if you Duck, Duck, Go (or, Google) a "DHS Laboratory" search, hopefully, you find this as a start. More than a one-stop shop, a comprehensive and state of the art solution by experts in severe accident mitigation.